Lake Mapourika is a kettle lake. It was formed when a large block of ice was left behind by the retreating Franz Josef Glacier some fourteen thousand years ago. It is ten kilometres north of the Franz Josef Glacier Village on the State Highway. 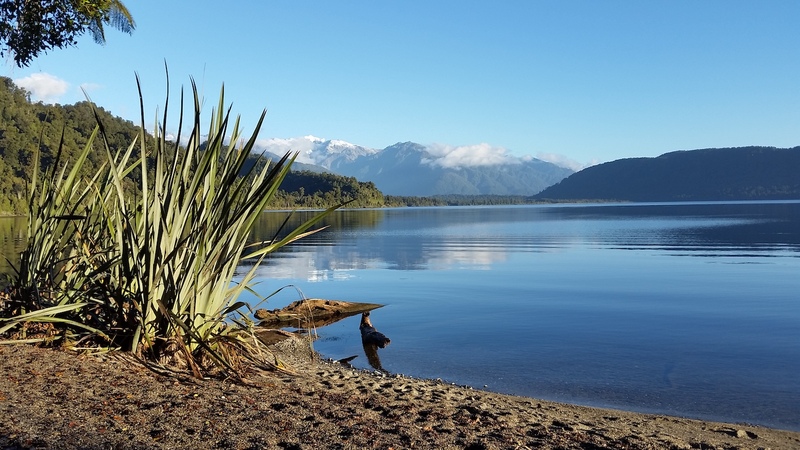 It is the largest lake in the Westland Tai Poutini National Park. The lake is fed by a number of small streams that come from the surrounding bush clad hills. It drains into the Okarito River. Mapourika roughly translates from Maori to English as the "Flower of the Dawn" and dawn is an excellent time to go fishing on the lake. If you are feeling energetic you can hire a freedom kayak, or take a guided kayak tour. A more relaxed way to see the lake is on a boat cruise or from one of the two picnic areas. Whichever you choose be sure to look out for the abundant bird life! Jetty Bay, the southern access point to Lake Mapourika, is 8km north of the Franz Josef Glacier Village on State Highway 6. Jetty Bay was originally called “The Landing” because people and the post would land here after travelling from Okarito. The bay is at the southern end of Lake Mapourika and has a picnic table, toilet, boat ramp and parking area. There is another boat ramp off State Highway 6 at the northern end of the lake. Look for the turn off to Otto’s Corner and McDonalds Creek campsite. Otto was the original gardener at the Graham Hotel. He was noted among the locals for his award-winning vegetables that won many ribbons at the Whataroa Agriculture & Pastoral Show. He carefully landscaped this area and took immense pride in seeing people having picnics at this beautiful site. From either of these spots, you may be able to catch a glimpse of the rare crested grebe, scaup, grey duck, mallard duck, black swan, white-throated shag, white-faced heron, kingfisher, kereru, tui, bellbird, tomtit, grey warbler, brown creeper, silvereye and robin. For more avian information go to www.birdingwestcoast.co.nz. Salmon were first released as early as 1932. Today you can land a decent sized salmon dinner from the 1st October to the 31st March. Trout can be caught all year round. Expect your trout to be in the three to five pound range, and the salmon are even bigger! The annual Lake Mapourika Fishing Competition is organised by the South Westland Lions Club and attracts a mixture of professional and amateur fishermen every February. The competition runs for three days. The camaraderie and tall stories seem to be just as important as the actual fishing. This year fourteen decent sized salmon were caught, and the locals are still waiting for the big salmon run. The dense bush surrounding the lake and tea-coloured water makes fishing from the shoreline challenging. However, there are two boat ramps that open up the lake to both trolling and casting. There are a number of experienced fishing guides in the area if you want some local knowledge; and fishing licenses and basic fishing supplies can be purchased from Franz Josef Glacier Motors.